A budget level ISA sound card from many years ago. Pretty much average, it is what a sound card had to be back then, a DAC (for output), an ADC (for recording) in full-duplex (able to do both at the same time) which is software based unless the Wavetable card is attached. The DIP package is a 2025 series op-amp. 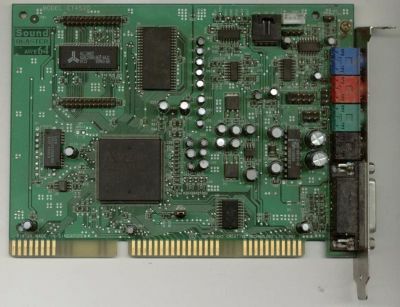 The ALS120 IC does have an IDE interface on board, but it is unimplemented on this card, seen by the number of floating pins on the SM-PLCC package. It also can be seen that an electrolytic capacitor has broken from the card in position C31. This appears to be just a smoothing cap and has no identifiable effects on operation. This card is about on par with the Soundblaster16. Back then all the sound card was was a codec (encoder/decoder) to convert digital PCM data to analog audio and back again. Some handled crude MIDI synthesis but most were just employed as nothing more than what our onboard AC'97s do. Avance Logic have since been aquired by Realtek Semiconductor and now operate as a subsidiary, designing and producing Realtek's ALC series of phenomenally popular AC'97 codecs, such as the ALC650 and ALC850. While the 'AWE' thing was mostly a joke, submitter David Young comments that "It was the first sound card I had that wasn't obviously 'the computer' when connected to my stereo" and he has a point. As mentioned in the AWE64 above, the output quality of Creative's AWE 32 and 64 was excellent, for the time. Like the AWE32, both AWE 64 models use clumsy MIDI synthesis and the wavetable (card attached in this example) doesn't really help things, the AWE DSP uses an awful bank filter for pitch shifting. It's important to understand that back then, MIDI was a very important feature. Games used MIDI for their music almost exclusively and so a better MIDI output was one of the main reasons to select a sound card. The sample bank (basic instrument sounds, which were then pitch-shifted by the hardware) on Creative sound cards was usually fairly basic until the Wavetable was added, a much extended bank of sounds. See the AWE 32, above, for the single chip used to store samples on that card, the AWE 64 is not much different. Adding the Wavetable made MIDI output much better. Later, Creative would take the sample bank into system RAM (as a SoundFont) as the PCI bus was more than fast enough to stream numerous audio channels over but it wouldn't be until the Audigy2 that Creative would make a decent PCI sound card and by then, MIDI was all but irrelevant, CPUs had become easily powerful enough to decode MP3 audio with negligible impact, something a 486DX66 needed almost all its available execution power to do. 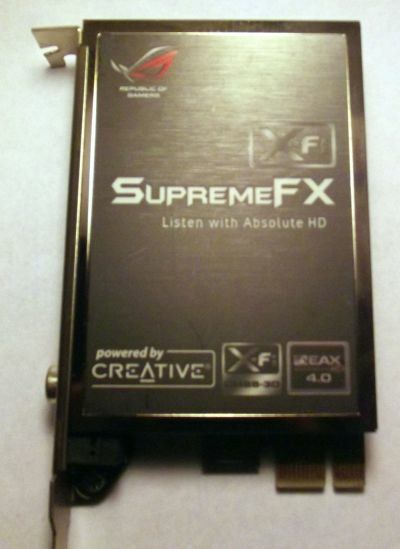 This particular card is the "Gold" variant which means it has coaxial S/PDIF outputs where the system's wave output bypasses most of the card's processing completely and is only mixed with any MIDI being output; The card becomes just a mixer. The CT8903-DAO's name denotes this feature, the DAO means "Digital Audio Output". Oh, and gold plated connectors. Because they make so much difference. ADC/DAC duties are handled by Creative's own CT1745A-S, the square PLCC package just right of the memory upgrade module. Of the critically acclaimed ISA CX423x series, which included the Turtle Beach Tahiti, these sound cards have aged with grace. For the same price as the Avance ALS120, much better performance and high quality sound made these the sound cards of choice when they were new, blowing the SB16 clean out of the water (the 86dB of the 16bit, 44.1kHz codec may not be great by today's standards, but it was awesome back then). Several Pentium era motherboards shipped with CX4232B or CX4237B chips on board to provide fine integrated audio. The card does have the positions soldered for a Wave Blaster wavetable card, but the header isn't affixed. The layout of the card is a trademark of Crystal, it's neat and efficient high quality component placements contrast starkly with the cheap ALS-120. 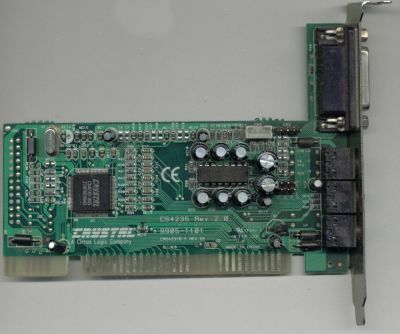 The CX4235 is the successor to Crystal's CX423xB series and was released in 1997, indeed the PCB of this card is denoted "CAD4237B", telling us it was originally designed for the CX4237B. All Crystal's sound devices had intregrated ADC/DAC and capable of using both simultaneously, something which was desurable at the time, known as "full duplex". Like the ALS120 also on this page, the DIP package is a 2025 series op-amp, this one being fabbed by ST. This'll bring back memories for some people. 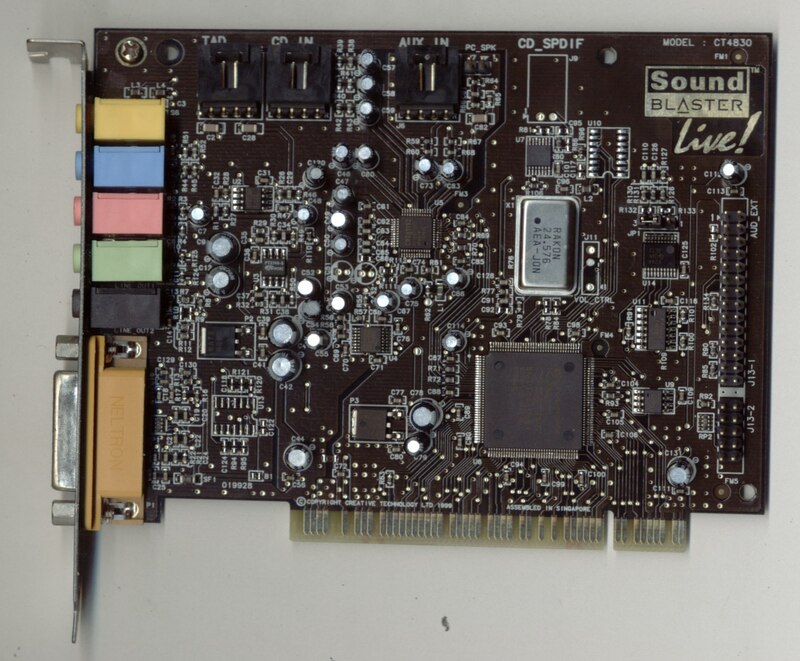 The Soundblaster AWE64 was the last decent sound card that Creative Labs made until the Audigy 2 (and even the Audigy 2 has its share of issues) almost eight years later. The RAM chip on the top left (between the wavetable connectors) is a 4Mbit (512kb) 60ns EDO chip and designed to store the MIDI samples. The chip next to it is an EMU 8011-01 soundfont (mostly a ROM) while beneath it is the main DSP, though you can hardly call it a DSP, the CT8920 which formed the backbone of the AWE64. The other chips are an LS245 octal bus transciever (20 pin DIP near the edge connector), GM71C4256BJ60 (far left, datasheet) 128kb (256k words, 4 bits per word) general purpose fast page DRAM and a Philips TDA1517P (datasheet), a dual 6W amplifier since back then (as the other ISA cards show) the sound card was expected to be able to directly drive speakers. 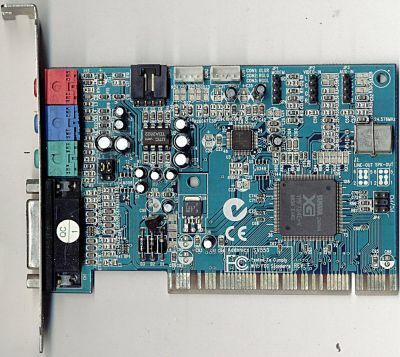 In all, it was a quality built sound card (utterly obsolete) but with flawed implementation, especially in its OPL-3 output which uses a very clumsy second order sine wave generation, giving very bad harmonics. The chipset here is completely different to the the AWE 64 Gold we also have. For one, there's no discrete ADC/DAC! The Yamaha YMF724E-V as used in the Addonics SV550 wasn't so much a sound card as a MIDI music card, featuring Yamaha's XG MIDI extensions, well regarded among MIDI enthusiasts. The YMF7xx series (datasheet for the YMF724F, a slightly later version) were among the first to lock their sample rates at 48,000Hz. All consumer sound cards usually resample to a flat rate, but it's usually 44.1kHz (meaning most CD quality audio will need no resampling at all) but the YMF7xx locked itselt to 48kHz. Various flame wars have been fought over the wisdom of this move. These dual power amplifiers are also quite ideal for portable headphone amplifiers and will run from a small 7.2V or 8.4V PP3 NiMH for quite a while. The card itself was nothing special. Dell included it as a card and as an onboard device in several of their Dimension machines starting with the V series in 1998 because it was one of the first stable and reliable PCI audio cards and these were cheaper than their bulky ISA cousins. Windows 2000 and XP will pick this up automatically. WindowsME also will, but can have problems with DVD playback, in which case the VxD drivers are needed instead of the WDM drivers. Just for fun, compare the fullsize image of this card with Wikipedia's attempt of an earlier revision of the same card. A rework of the CT4750, the PCI series of Soundblasters uses the Ensoniq chipsets, Ensoniq having been aquired by Creative. 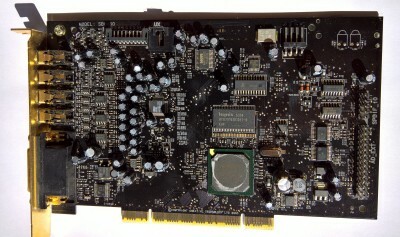 This card is no longer supported in favour of the inferior CT4750 model. The drivers in Windows2000 and WindowsXP are codec drivers, hardly any hardware features are enabled, not even hardware MIDI. The card, in hardware, does support quadrophonic sound, but the drivers available do not enable this feature. This is around the time when people started to really dislike Creative. The components on this card are the "Creative 5507" (really an Ensoniq chip) DSP, the Asahi Kasei Microsystems AK4531AVQ codec, a low-cost 16 bit codec designed for embedded devices which handles the audio I/O and a big ST TDA7360 22 watt stereo power amplifier for driving small speakers. Without a competent heatsink, as seen here, it won't be doing 22 watts. ST describes the TDA7360 as "designed for car audio applications". A smaller development of the Vortex series, this is a gaming sound card from a good few years ago. Unfortunately, it didn't like me at all and blue screened Windows2000 on two seperate machines whenever I tried to install its drivers. Windows2000's stock drivers didn't work either. WindowsXP had no problems whatsoever even though it used the same driver files! When I did get it working in Win2k, any attempt at A3D would result in a blue screen. 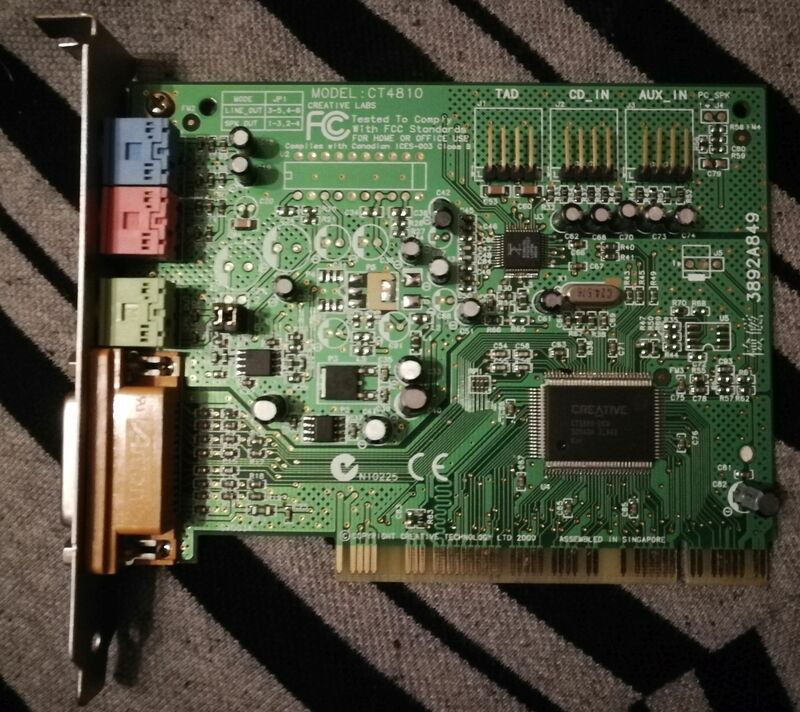 This particular card bears a sticker on the back informing us it is V1.1 and another saying it was manufactured in March 1998. Other than the Aureal 8820 DSP, the codec employed is the Analog Devices AD1819A. A common LM1877N dual channel 2 watt op-amp power amplifier is employed to drive speakers, typically used as a successor to the 2025 series and widely considered to be much better. 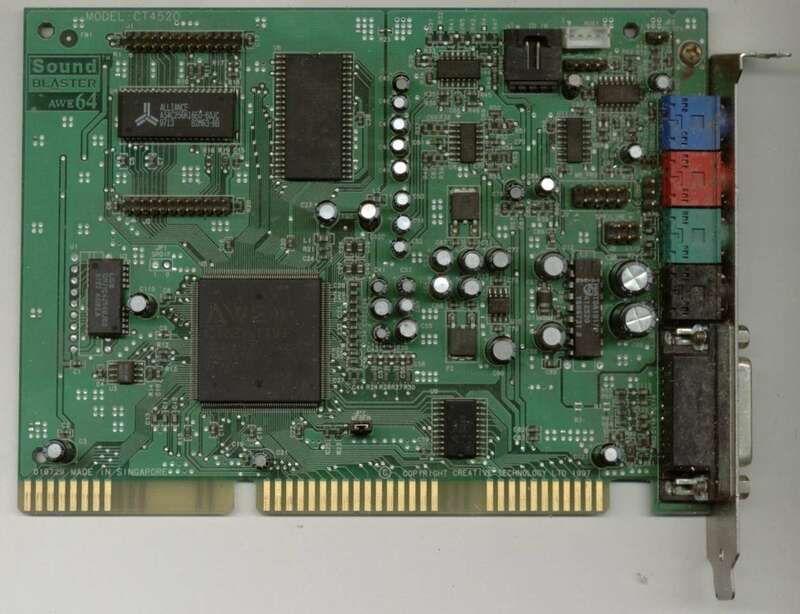 This card was released with patchy to no driver support; You could plug it in and it would simply not be installed by the supplied "Liveware" CD - if you got a CD at all, the OEM cards were usually devoid of any documentation or driver. No problem, you'd just go online, grab the driver, install it, job's good. It had no official name. This one carries a retailer's sticker on the back saying "creative 1024 live oem" in hideous Comic Sans MS. Initially the CT4830 was the OEM version of the card, but then it entered retail as the Value OEM variant then again as the 1024 OEM variant and as the Value Digital OEM even though the digital output was completely propeitary. It was often a lottery working out exactly what card you had since the name alone would't do it and Creative seldom refer to their part numbers (CT4830 in this case). The specs were fairly typical for the day, hardware mixing (131 hardware channels, 3 permanently unavailable, 128 user/system available), four output channels (2 front, 2 rear), and hardware sample rate conversion. The best part about the EMU10K1 is its ability to be reprogrammed, the DSP is programmable in software. The EMU10K1, however, is not all rainbows and flowers. Its sample rate is locked at 48kHz and must resample everything to 48kHz before output or processing, this causes quite a bit of distortion. Poor frequency response plagued the SB Live! throughout its production and on every model. This manifested as linear distortion which somehow was worse on digital outputs, even at the fixed 48kHz. The codec employed is Creative's own (at least branded Creative, it may well be an AKM or AD). There is no power amplifier on the board, this was after the ability to directly drive speakers was no longer valued. The Sound Blaster Live! Drivers were not to PCI specifications. This caused too much noise over the PCI bus. The engineers had to work out a way to filter this noise and released a patch to motherboard manufacturers which replicates a BIOS change. You read that right. VIA had to fix a problem in Creative's driver at the motherboard BIOS level by altering the behaviour of their chipsets to work around the issue. It got even better. MUCH better. As Windows2000 was nearing release, MS still had not recieved drivers from Creative which could pass WHQL and get on the Windows 2000 Hardware Compatibility List - This is fact, the SB Live! did not appear on the HCL until very late. This would have been a disaster for Creative: OEMs would not have been allowed to preinstall Windows 2000 on a system with a Soundblaster Live installed! Legend has it that Microsoft demanded Creative's specs and source code and proceeded to write the driver themselves, then billed Creative for the development. Despite that, the flawed nature of the EMU10K1's PCI interface continued to dog stability in both Windows 2000 and Windows XP, crashes identified as being "emu10k1.sys", the card was simply not PCI compliant and anything could cause it to crash. Oh and don't lose your CD. You can't download the full driver package from Creative. This uses the CT5880 DSP and the Sigmatel STAC9721T AC'97 codec. It's immediately obvious that the upper left of the card is not fitted. This, as can be seen from the two jumpers nearby, is a power amplifier for running passive speakers. By 2000, speakers generally integrated their own amplifier and were "powered" or "active" speakers. And many, many more. Was it any good, then, to be used in so many products? Nope. It was downright mediocre. Average or typical would be used a lot. It's important to put them in context, however. These things were bargain basement speaker ports as most motherboards in the day did not have onboard audio, so, much like Nvidia's many TNT2 M64s for video and barebones "add a necessary port", a bottom feeding solution was needed. This was that solution. A budget minded card but with many high end features and excellent sound quality. Notable not only for its low price, but also for having both optical out and optical in (TOSLink). 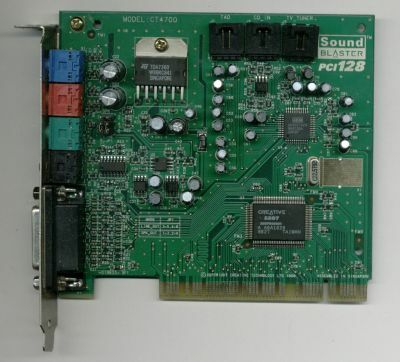 This four channel sound card represents the little brother to the Turtle Beach Santa Cruz and the Hercules GameTheaterXP. Crystal had been bought by Cirrus Logic years ago, but were still using their own name in 2001. 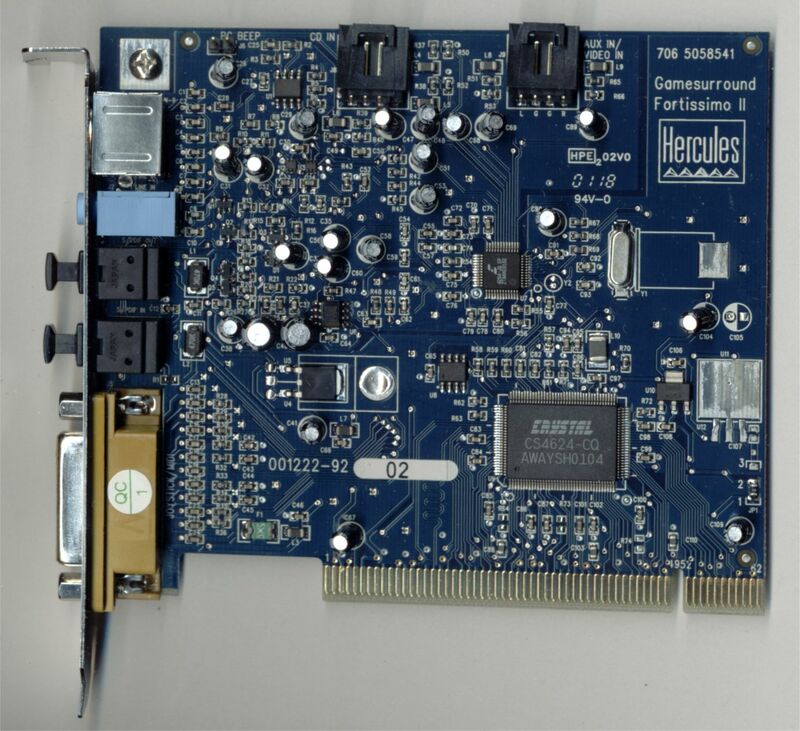 By 2006, however, most CS and CX components were produced under the Cirrus Logic name; Such as the CS4382 AC'97 which handles codec duties on a SoundBlaster X-Fi. The only thing it could perhaps be faulted on is the waste of an awful lot of backplane space on the silly game/MIDI port when features like coaxial S/PDIF (in and out), a centre or LFE channel, or even a powered speaker-out would have been better suited. This guy was bought to provide the TOSLink input and, with an AVerMedia TVCapture98 video capture card (and DScaler), used to hook up a PlayStation 2 to the PC, save a little desk space, and allow PS2 games to be displayed in deinterlaced upscaled glory. Today, we'd just use the PCSX2 emulator. After the... well, tell it like it is, utter debacle of the SoundBlaster Live, Creative had almost destroyed market trust in the entire sound card market. Would the X-Fi line restore faith in the market? I bought this to replace a Sound Blaster Live Value, and it sounded a LOT better. The X-Fi did all of the fancy EAX effects that the Audigy did; the only downside was that it did some sort of odd resampling when put in "Game Mode" or "Media Mode" that made things sound... not quite right. Since I only had a 2.1 sound system at the time (old stereo amplifier hooked up to 2 HTIB-style speakers and a sub), I didn't really care about this since in Audio Creation mode it bypassed most of the Creative ridiculousness and provided nice, clean sound output. When I upgraded to Windows Vista, I needed to download a piece of software called "Creative Alchemy" that allowed EAX effects to still work in Bioshock and Mass Effect since Vista re-wrote the audio driver stack and made EAX essentially useless. I replaced the X-Fi with a Xonar DSX in 2012, and it sounded even better; the X-Fi has been gathering dust ever since. Creative was in a bit of a bad space. Creative made and sold audio DSPs, something the market was rapidly moving away from. CPUs were getting very powerful and audio represented a very small data stream, easily processed. Each second of 16 bit, 44.1 kHz audio was just 76 kilobytes. Considering that even an Athlon XP 1700+, common in 2003, could sustain processing on up to 2,500,000 kilobytes per second using powerful SIMD DSP instructions, games began moving away from Creative's EAX API and using software sound processors like Miles Positional Audio and DirectX 7 HRTF. In response, Creative added weird room modes to the X-Fi, such as the Game and Media modes Bryan calls out. At this point, Creative was paying developers to include EAX, and paying publishers to force developers to include EAX! Why implement a feature which a majority the PC gaming market can't use? To Creative, the crisis was existential. If everyone moved away from EAX, there would be no Creative. 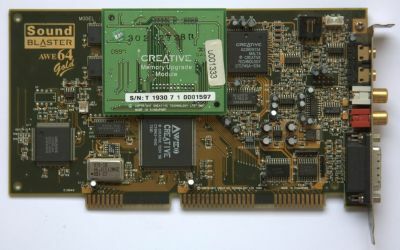 The digital side of this card is handled by a Creative CA20K1 DSP, a descendant of the EMU10K in the SoundBlaster Live. It can mix 128 channels, each of which can have 8 independent effects added. All sound going into the CA20K1 is upsampled to 88.2 or 96 kHz (sample rate is doubled) before any other processing. Then mixing is done by a poly-phase finite impulse response (FIR) filter, which Creative claimed was as good as a 256-order FIR but only implemented as a 128 (or 96) order filter with an output at 192 kHz, which is divided by four to get a 48 kHz output (or 96, or just left at 192). By doing processing at a much higher sample rate, errors introduced by the low order FIR are minimised, but errors from reasmpling 44.1 kHz to 192 kHz via the FIR filter are unavoidable. The downside to all that is that absolutely everything has to be resampled to 48 kHz. Resampling to 44.1 kHz, not an even fraction of 192 kHz, would introduce more distortion than just going to 48 kHz, and the output of the FIR was locked to 192 kHz. This caused unavoidable intermodulation distortion when dealing with any 44.1 kHz source, such as almost every sound found on a PC, in a PC game or handled by a PC. If using 48 kHz samples or other audio, there was very little distortion. The analog side is handled by the Cirrus Logic CS4382 AC'97 compatible 8 channel codec, which can run up to 24 bit and 192 kHz with a quoted 114 dB dynamic range - It was used a lot in high end receivers, AV equipment and DVD players. This feeds into ST Micro 4558CN dual channel op-amps, which drive the three outputs. So, the analog side is excellent, the digital side is powerful, how do they go together? Most users, Bryan included, put their cards in Audio Creation mode. What this does is bypass the entire digital side of the card and go straight to the CS4382. Creative used this chip quite a lot, in also the X-Fi Fatal1ty, X-Fi Titanium, SB Live! 24-bit and other members of the X-Fi generation. In Audio Creation mode, they were identical, even down to using the same ST 4558CN output drivers. With EAX unsupportable in Windows Vista, Creative made it a software wrapper around OpenAL, with things like Creative's own Alchemy, which essentially used the sound card as an extremely expensive dongle and did all its work on the CPU. For some reason, Creative was not very keen to make that very well known. This PCI-Express card was supplied with Asus' high-end Crosshair III Formula motherboard. Surely then, here's a "motherboard" sound solution which has some meat behind it? It has the exact same 7.1 jacks you'd find on a motherboard, the same TOSLink out, the same S/PDIF coaxial out. And, as we're about to find out, the same codec. The codec on this card is an Analog Devices AD2000B and as the bottom image shows, there are really no other components on the card. Some electrolytic capacitors and a DC regulator, which all codecs need anyway, regardless of how they're mounted. What, dear reader, is the AD2000B? Analog Devices has no product listing for it. The detective story now comes to the operating system, where the device identifies itself as "1989" - Yes, it's an Analog Devices AD1989B. No more, no less. It does appear to be slightly customised, in so much as it is functionally identical but contains logic to detect the motherboard and refuse to work on any other motherboard! The silly thing is that the AD1989B is a very common motherboard audio codec. A whole heap of software is installed to make it "look better" in the operating system, adding EAX through to 4.0 and OpenAL, all entirely in software. The card will not work with any other motherboard, even though it has no reason not to, it won't even initialise itself - It'll just plain not show up anywhere. In essence, this is a bog standard onboard audio codec with some Creative crapware to slow down the system and a dose of marketing. As in "try not to step in the marketing". For what it is and how its mounted, it essentially removes one of the two PCI-Express x1 slots from the motherboard for no reason at all. This, then, is actually a functional negative for the motherboard and it cost more than doing it right! Asus (it's pronounced Ah-soos) Xonar series was a bit of a surprise on release. 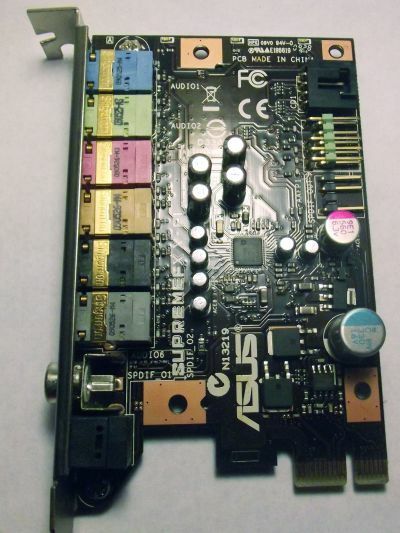 Asus made motherboards, and the occasional video card. What was this sound card doing?! We need to wind back to 2008 to find out what was going on. 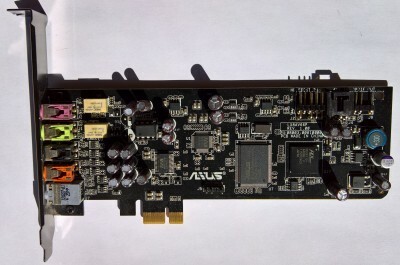 Asus already had some Xonar cards on the market and they were highly regarded for their transparency, as well as being a "known good" where onboard audio solutions were very hit and miss. Good onboard audio was as good as anything else (or better!) but when it got bad, it got really bad. Having a Xonar meant you could shop for motherboards based on other, more important, criteria. In 2008, the market was open to disruption. Creative had severely pissed off PC audio enthuasists by going after an enthusiast who fixed Creative's severely broken Windows Vista (and, later, 7) drivers, by reinstating features Creative couldn't be bothered to do. A week later, Creative was forced into a humiliating retraction after a storm of outrage. After stating that they "forbid all so-called driver development by third parties", Creative "clarified" that it "did not make it as clear as we would have liked that we do support driver development by independent third parties". Yes, Creative. Forbidding something is not very clear that you support it. The damage had been done, and Asus' savvy marketing department saw a hole in the market and aimed a big cannon straight at Creative. A few weeks later Asus announced that EAX and EAX 2.0 would work perfectly on its Xonar sound cards, right back to the original Xonar. Before that announcement, gamers used Creative cards for games, but often Xonars for music. After it, well, what does anyone need Creative for? The Xonar DX in 2008 was no technological marvel, but it didn't need to be. It buried Creative and pissed on the grave, and there was much rejoicing. This gives us our answer to "What was this sound card doing?!" Why, dear reader, it was kicking Creative's arse. The Xonar DSX is still in use in my primary PC. Modern motherboard sound is good, but this card sounds just a LITTLE bit better. I bought it to replace my X-Fi back in 2012, after the Tech Report published their review and showed that it provided incredibly high quality sound for not a lot of money (Tech Report ). This card's drivers worked well (and continue to do so even under Windows 10), and it's nice to have a separate sound device for recording and playback. It's currently hooked up to a decent pair of bookshelf speakers and sounds about as good as the on-board audio or the HDMI/DisplayPort passthrough on my monitor; its one main advantage is REALLY good recording ability. I haven't tried its optical output or its Dolby Digital real-time encoding at all, since I've not had a surround sound system since buying the thing back in 2012. The PC audio market was stable and Creative nowhere to be seen. Asus' Xonar DSX, with the DGX, followed in the DX's footsteps as a budget-friendly audio solution. Very importantly for some, The DSX's headphone op-amp was replaceable. If you didn't like it, you could pull it from the DIP socket and insert your own! Fitted as standard was the Texas Instruments NE55329. With audio quality at the higher end being solved, it shouldn't have been a surprise to anyone when Tech Report's objective RightMark Audio Analyzer quality tests showed Realtek's high end ALC898 beating Asus' entire lineup embarrassingly often! AC'97? Azalia? Codec? Interfacing between the analog (audio) and digital worlds is the job of the codec, a portmaneau of "encoder" and "decoder", as it does both things. Early sound cards used individual DAC and ADC components but, by the mid 1990s (e.g. the AWE64s and the ALS120 on this page), DAC and ADC had been folded into the main chip. Sometimes the same circuitry was used for both, so a device couldn't record (ADC) and playback (DAC) at the same time, these were termed "half-duplex". Very early sound cards were half-duplex, but the earliest on this page, the ALS120, was full-duplex and fully integrated. Intel and Microsoft specified the AC'97 standard in 1997, as part of Microsoft's PC97 standard. This gave audio ports their colours, which are still used today, but also specified the 48 pin PLCC package for a codec. 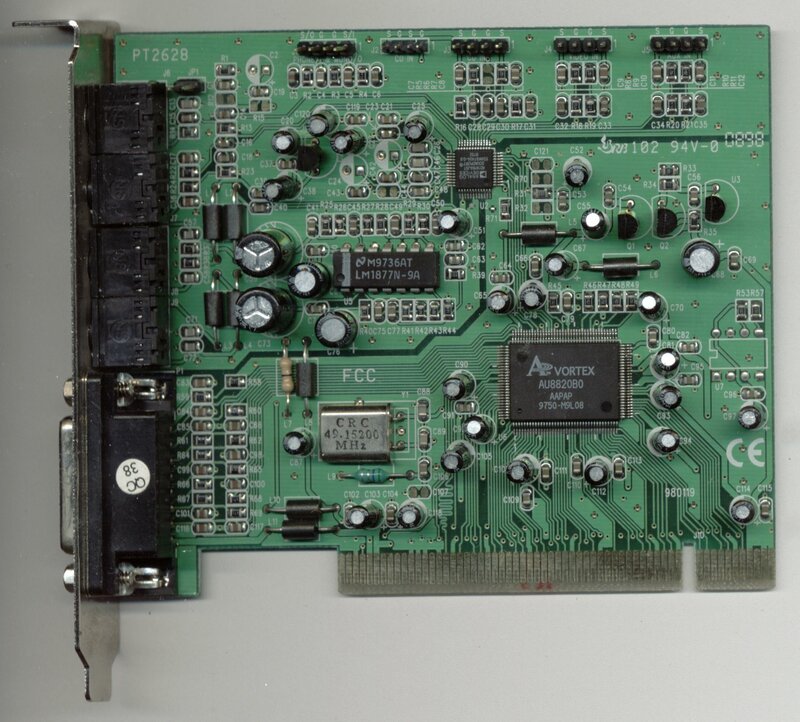 The codec had no bus interface but for the AC-Link, which would interface with the "DC'97" controller in the motherboard chipset which would output up to nine channels of digital PCM audio, up to 20 bit precision and 96 kHz sample rate. Minimum requirement was 48 kHz (fixed) and 16 bit. 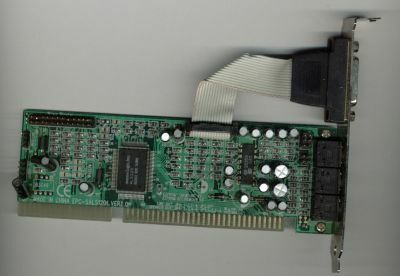 The nine pin (ten plus key) front-panel connector was also part of the AC'97 standard. AC'97 was technically HD, but Intel in 2006 released "Azalia", a specification for AC'97's replacement, now simply called "HD Audio". It is much the same, but raises maximum sample rate to 192 kHz and sample resolution to 32 bits. Full 32 bit resolution is vanishingly rare, since it implies a dynamic range much, much greater than can actually exist in nature, a range akin to hearing a baby's heartbeat from ten feet away while a 747's four jet engines throttle up overhead. HD Audio also specifies the Universal Audio Architecture, a means for drivers to work with any and all HD Audio components, so any OS from Windows 2000 onward has support, Linux rolled it in years ago, and all major BSDs, OpenSolaris and MacOS also have full support. The front panel connector was revised, and made incompatible with AC'97, which annoyed a lot of people. HD Audio provides the same two stereo jacks, but doesn't specify them to be inputs or outputs: They can be either. AC'97 also has a "break loop" design, where plugging in a jack breaks the audio connection and redirects it mechanically to the headphone, so it has a "return" for each output channel, which sends the audio back into the system to be sent out to a speaker instead, without needing any software or driver or indeed any intervention. Plugging an AC'97 "dongle" into a HD Audio header might work, but sensing is lost, pin 4 has to be present, and pin 7 has to be cut. Plugging a HD Audio dongle into an AC'97 interface may get sparks and damage. When something is almost, but not quite, backwards compatible, the term "combatible" has been seen. When recording, the order is reversed and "Output" becomes "Input" but the same sequence of events remain. Older sound cards do not have the DSP stage, while onboard sound (AC'97) is just the bare codec, AF components and ouput, DSP is handled either in the motherboard chipset (nForce2) or part chipset/part software (nForce3 Sonata) or entirely software (everything else). Modern DSP sound cards evolved from the MIDI processors of older ISA sound, when MIDI was everything music that a PC had. Bank shifting, multi-tap filtering and pitch manipulation had to be done and if done by the sound card, generally sounded better than the crude attempts things like Microsoft's General MIDI could (and can) manage. As Windows95 came around and programs had a standard, well documented means to stream sound (and the CPU to manage it) through Windows Sound System and later DirectX, MIDI became meaningless as pre-recorded CD quality audio was always going to be better than anything MIDI could manage. Aureal were first to realise that the filters used to generate MIDI could also apply spatial effects to other sound samples, not just instruments. Aureal's A3D used various software techniques and hardware filtering to emulate how sounds would sound if heard through walls, from behind, from above, through water, etc. Modern DSPs provide this functionality with various degrees of success. Creative are recognised as the leaders in the field, but are dogged with spotty output quality, poor driver support and bad stability. Windows Vista, partly because of Creative's incompatibility issues, has dropped support for what had derisively become known as "hardware reverb" and, in a textbook example of the Wheel of Reincarnation, sound cards are once again simply codecs while AMD's GPUs are actually picking up the slack. The GPU knows everything about the 3D scene it is rendering, so adding audio sources to that offers the greatest positional accuracy!